Thor is currently facing a whole heap of problems in The Mighty Thor—and so is Jane Foster. Everything is about to get trickier with the re-arrival of Loki in her adventures. But that’s not the weirdest thing going on with Loki’s return ... his face is. Minor Spoilers ahead for The Mighty Thor #2, by Jason Aaron, Russell Dauterman, Matthew Wilson, and Joe Sabino. The Mighty Thor #2 ends with Thor coming up against Loki amid a huge battle in the Light Elf realm Alfheim, in which Malekith is up to his usual tricks wanting to murder everyone for shits and giggles. Thor stands alone, mainly because Odin has turned into a tyrannical jerk and sealed himself away in Asgard. It’s all very cool, and it’s been interesting to see Jane have to face her all-too-real cancer battle as well as the universe-threatening destruction being wrought by Malekith and his cronies. But we’re not here to talk about The Mighty Thor. We’re here to talk about one single panel, the panel in which Thor and Loki encounter each other in for the first time in ages. Because holy hell did they actually turn the comics Loki into Tom Bloody Hiddleston!? Also, he has weirdly wispy facial hair that Russell Dauterman draws in this wonderfully evocative way. I don’t know what I like about it so much but it’s just the right sort of slight skeevy look that’s perfect for Loki. But that last panel though, you guys. That’s 10o Percent Premium Free Range Tom Hiddleston, right? Am I going crazy? Am I suddenly seeing Tom Hiddleston everywhere? If so, why? Should I consult a doctor? Here’s Comics Loki side by side with Avengers Loki, just for even more comparisons. Maybe this is Loki’s greatest trick of all. 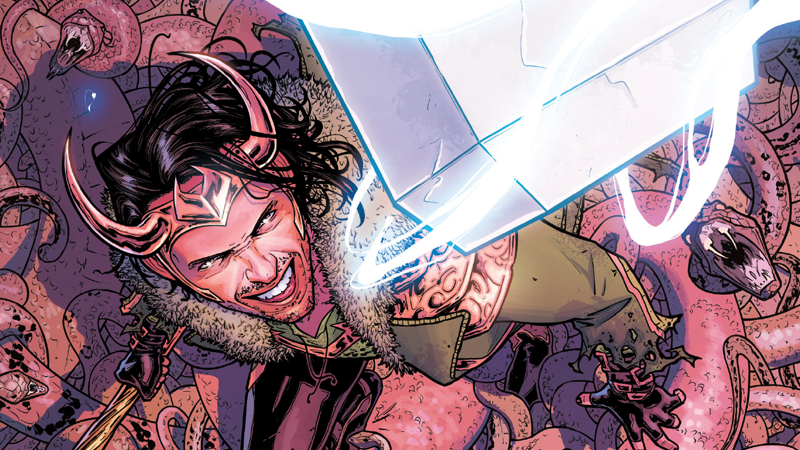 But man, even if it doesn’t last—like I said, Loki doesn’t look this close to Hiddleston throughout the issue, so it could’ve just been an innocent reference point for Dauterman as an Easter egg or something—I kinda like the thought of Tom Hiddleston hanging around with Thor on the big screen and on the page.